A short book should receive a short review, right? Maybe, maybe not. 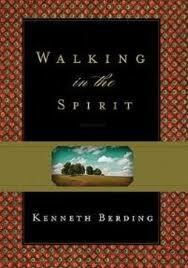 But Kenneth Berding’s book Walking in the Spirit is most certainly a short book, coming in at 127 small pages. It’s not quite a booklet, and most certainly not a textbook. Yet there is a lot of substance to be found within it’s pages. This is a practical book that explores the concepts of living and walking in the Spirit. The walk is an expression of the positional life. Set your mind on the things of the Spirit. Put to death the deeds of the body by the Spirit. Know the fatherhood of God by the Spirit. Let me be clear: this book is written to help people grow in their understanding of their spiritual life and how to walk it out. It’s by and large aimed towards a general audience and would be excellent as either a small group study or perhaps even a high school or college group. It’s not that the book is “weak” on theological substance, but Berding purposefully shares wonderful biblical and theological insights from within the midst of his own personal experience of walking in the Spirit. This is largely Berding’s thinking on Romans 8, as one can tell from the seven principles mentioned above. First, I really appreciate that Berding is having an influence into the theological reflection of non-charismatic (Continuationist) types. His book on spiritual gifts (What Are Spiritual Gifts? : Rethinking the Conventional View) was extremely insightful and much needed for both Continuationists and Cessationists. But his educational background includes evangelical training that is outside of the “charismatic” movement (Westminster Theological Seminary, Talbot School of Theology, Trinity Theological Seminary, and Multnomah University). So I appreciate that some of the truths that are often stressed within the general Charismatic/Pentecostal/Third Wave groups is found also outside of those traditions. Actually, that’s a great reminder for Continuationists! They (we!) are not the only ones who believe life in the Spirit and walking in the Spirit are important to discuss, teach, and do! Thinking impacts action. Thank you, Dr. Berding, for making that clear. “… because I had grown up in a church that was somewhat allergic to the Holy Spirit, it took me quite a few years to begin to apreciate the central role the Spirit plays in our prayers. Simply put, the person who experiences the blessing of answered prayer is the person who is sensitive to the guidance of the Spirit as he or she prays. As children of God, our responsibility is to learn to pray “in the Spirit” (Eph. 6:18; Jude 20) so that what we pray for is in accordance with the will of God.” (p.100). This is the most common understanding of “praying in the Spirit” within evangelical circles. Of course, many Pentecostals have argued that to pray “in the Spirit” is to exercise the gift of tongues. In fact, even the world-class NT scholar Gordon D. Fee argues such in his excellent God’s Empowering Presence, Fee makes a case for this even in Romans 8:26! I’m not sure exactly what to make of this. Fee’s exegesis is, as usual, quite convincing. Yet the practical side and the overall truth of what Berding states is equally convincing, as well as important for the church. All in all, Walking in the Spirit is a good introduction to Romans 8 and quite a fun read. It’s personable, insightful, biblical, theologically-reflective, and actually fun to read! Typical Berding, if you ask me.